The Monaco Grand Prix is one of the world's greatest sporting experiences. Monaco provides glamour, colour and atmosphere while the circuit offers the spectator the chance to get as close to a F1 car as is humanly possible. We have been looking after corporate clients, VIP guests and small groups for many years and our attention to detail is second to none. Monte Carlo offers a spectacular array of choice when it comes to travel, accommodation, access and hospitality. Having operated in Monaco since 1994, we know Monaco superbly well and are therefore able to advise on a seemingly bewildering array of possibilities to provide you with a memorable weekend. We offer a weekend travel package and day trip package which are first class and will provide a memorable F1 experience. Any choice of hospitality can be added to your travel option such a VIP balcony hospitality. However, please call us for a bespoke quote or e-mail info@onsite-events.com if these packages do not suit. Our exclusive day trip from London Stansted offers complimentary parking, an in-flight service including hot meals and a complimentary drinks service! Our standard tour below features a 3 night stay with flights from London Luton, hotel and transfers. We do specialise in bespoke packages as each tour is designed around your requirements. We can mix and match any requirement and we are confident that we can beat any like for like price. The 4 star Hotel Mercure Notre Dame is located Nice, close to the tram and train station and a 10 minute walk from the seafront. There are 198 well appointed guest rooms, newly renovated in 2016. Discover the hotel Rooftop with panoramic views over Nice and a swimming pool (open in season from May to September), new fitness centre and whirlpool bath, new Skylounge Bar and terraces with 'pampering' corners: a new experience in the heart of Nice. We can organise any manner of group airport and / or circuit transfers. This may be by Mercedes with uniformed driver, executive coach, helicopter, boat or even VIP branded minibus. 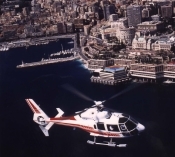 The 6 minute helicopter link from Nice to Monaco is not only a quick means of transport, it also offers breathtaking views of the Cote D'Azur coastline and also adds a splash of glamour to the weekend. One way flights and returns flights available, Wednesday through Monday. We can also organise a high speed boat transfer from Nice Harbour to Monaco Harbour, which takes just 45 minutes each way. Price from £95 per person return. These balconies are considered to be the best of the very many private balconies that look on to the Monte Carlo Circuit. Why? They are popular because they not only provide you with a prime view of the start finish straight but also offer exhilarating views of the whole harbour and beyond. Race viewing includes St Devote, Tabac, Virage Massenet for Casino, the exit of the Monte Carlo Grand tunnel and the Rascasse corner. Additionally, the giant TV screen is visible from the balcony. The Ermanno Palace building is located on the famous Saint Devote corner, or Turn 1 of the Monte Carlo street circuit. From our private balcony over-looking the port, you are sitting above the first corner, St Devote. This is an exciting - and noisy! - corner and usually sees plenty of action. You can also see the start-finish straight, the straight up to Casino Square, the tunnel to the chicane and the whole harbour area. There are also several plasma screens in the suite and a giant screen opposite our balcony. This really is one of the finest race-viewing locations in Monaco. Quite simply the best Grandstand at Monaco with views of the harbour, swimming pool and Tabac corners. We can provide an array of other grandstand tickets but K is generally considered to be the best. All stands are numbered reserved seating. None of the grandstands are covered. Rocher (general entry) ticket is standing only with a view of the giant screen across the port.